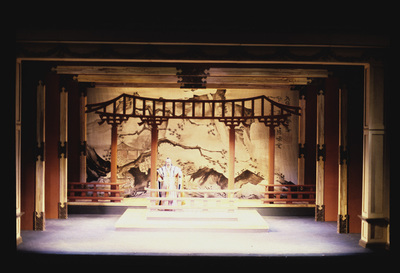 Scene from the Wright State University Theatre Department's production of The Mikado by Arthur Sullivan and W. S. Gilbert. This production was performed during the 1979-1980 school year. This slide is part of the UA6 - Abe J. Bassett WSU Theatre Slides Collection in the University Archives, donated by Abe J. Bassett. Sullivan, Arthur, 1842-1900; Gilbert, W. S. (William Schwenck), 1836-1911; Plays; Wright State University Theatre Department; Bassett, Abe J.